WEST WARWICK, R.I.--(BUSINESS WIRE)-- AstroNova, Inc., (NASDAQ: ALOT), a global leader in data visualization technologies, today announced that its TrojanLabel™ and QuickLabel® business units will be unveiling four new label presses and printers at PACK EXPO 2017 (booths C-2731 and N-532) and Labelexpo Europe 2017 (stands 9B50 and 9A39), two of the world’s largest exhibitions for the packaging and labeling industries. 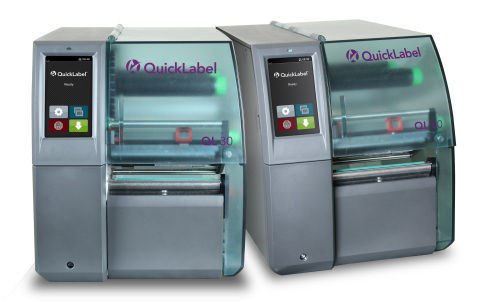 QL-30 and QL-60 – With their compact design and high print speeds, the QL-30 and QL-60 thermal transfer label printers are ideal for barcoding and other one-color labeling applications. These systems feature a full-color touchscreen interface, complete with video and Wi-Fi. The QL-30 and QL-60 are ideal for producing rugged images for hazardous substance labeling, including cardboard boxes, pallets and other surfaces exposed to extreme conditions for lengthy periods. Trojan T2-C – With the full capacity of a larger press, the T2-C easily fits into any size print department with a footprint of less than 4 square feet. For ideal print quality and registration, the T2-C is optimized with automatic tension control and a built-in web guide. The intuitive TrojanControl touch panel user interface is easy to use and facilitates a quick start-up. With 24/7 production in mind, print speeds up to 12 inches/second and resolution up to 1600 dpi, the T2-C is a press designed for brand owners, print shops and professional label converters who want to add high-resolution color inkjet labels to their portfolio. Trojan T4 – Extending the TrojanLabel product line into the high-production environment for professional label converting, the T4 is a robust single pass, label printing press and finishing system that uses the highly intuitive TrojanControl touch panel user interface. For advanced label production and finished rolls of superior quality, the T4’s advanced digital inkjet press prints, laminates, die cuts and slits brilliant full-bleed color labels up to 1600 x 1600 dpi resolution at speeds up to 60 feet/18 meters per minute. The T4 also allows the user to create blank die cut labels at speeds up to 165 feet/50 meters per minute. Designed for high-capacity production, yet perfect for short label runs, the T4 is fully integrated for efficient production and quick changeovers, to minimize downtime and optimize profitability. A compact all-in-one label production solution, the T4 is fast, reliable and easy to use, while taking up less than 7-1/2 feet of workspace. PACK EXPO 2017 runs September 25-27 at the Las Vegas Convention Center in Las Vegas, Nevada. Labelexpo Europe 2017 runs September 25-28 at the Brussels Expo in Brussels, Belgium.